But we’ll get to that. 😉 First, a little general news and commentary in the way of fictional worldbuilding. There’s so much that goes into a book that a reader never sees. Not just the seemingly-endless hours of plotting, organizing, writing, and editing, but all the little nit-picky details that may not even show up in a book but a writer needs to know. For instance, character family trees. Or timelines. Both of which have been tormenting me lately. I posted previously that, thanks to an idea from a devoted reader, I was adjusting a few stories to accommodate a change in character descendants which–though a lot of work–turned out to make the future of the series even better, giving a pivotal character a bit more scope when it comes time to tell his story. Once I started charting out the tree to bring various branches together to create this character, however, I nearly ran into a problem: marrying cousins. Thankfully, with a little more work, I was able to avoid that (sort of: it’s more like marrying second [or was it third?] cousins instead of first), but keeping track of and untangling the various branches to make sure I’d actually gotten it right nearly overloaded my brain. I finally had to print the whole thing out and pin it up on the wall in my office, just to be sure. And, I must say, seeing that posted really brought my little fictional world to life in a whole new way. The even more daunting project facing me, though, is the timeline. So far, I’ve been going along giving a few things concrete dates, but mostly keeping events pretty general. And until recently, that worked just fine. Until I came upon five books (two in my main series, and three in an upcoming trilogy that run alongside those two) that all have connected characters, as well as events that all happen within a few years of one another. And as I went to edit an upcoming book, I realized several details were a whole year off. Probably something the average reader would never be able to catch on to since there aren’t many actual dates referenced in the stories themselves, but I’m picky when it comes to that kind of stuff, so I had to fix it. At least I was able to keep the details on already-published books as they are, and just adjust the timelines in the upcoming books to match it. But then it occurred to me that I’ll eventually be writing books that take place prior to my main series, fleshing out key events that have been referred to and hinted at throughout the series. Which means I need to pin down actual dates for those things so I don’t accidentally write them in the wrong season. Or the wrong year. So all writing is now on hold as I go back through all my Shifting Isles books (all nine currently out in that series, as well as the Matchmakers trilogy and the upcoming Treble and the Lost Boys trilogy) so I can pinpoint exact dates for everything. Overkill? Possibly. But at least, that way, I won’t ever hit a snag like this again. And it’ll be better to do it now rather than after my series timeline stretches another five books into the future. Normally I enjoy reading my own books, but…ugh. This is going to be tedious. Worth it, but tedious. Then again, knowing me, chances are I’ll wind up with some huge insight or inspiration for the rest of the series or offshoots of it along the way. In the midst of all this, I’m also (very slowly but surely) trying to put together a wiki for the Shifting Isles world. That’s going to be a process and a half by itself, but it’s kinda fun seeing it come together, having all those little linked pages, showing how things connect. But, enough of all that. Time for the really exciting news of the day: the cover of my next release! I’ve never done a proper cover reveal before, and I’ve been sitting on this one for almost two months. Thank gods this day finally came, because not being able to share it was driving me insane! 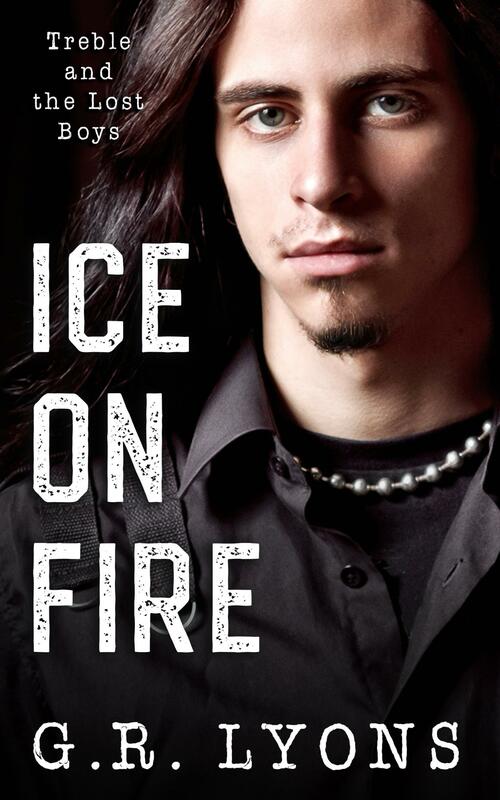 Ice on Fire is the first book in a new m/m romance trilogy, Treble and the Lost Boys, set in my fictional world of the Shifting Isles. The cover design is by Dana Leah at Designs by Dana. You can add the book to your To Read shelf on Goodreads, and the book is up for pre-order on Amazon in Kindle format (paperback will be available on release day, April 27th). The book is approximately 100,000 words / 340 pages.